After every few days we have new Facebook design interface. While few improvements are welcomed but introducting radical changes here and there annoy regular Facebook users to the core. Latest Facebook annoyance is highly distracting new updates Ticker box at top right side of Facebook interface. It displays real time updates of your Facebook friends comments, likes and shares. 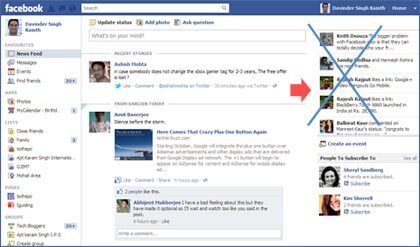 [New Update] Facebook has updated website interface with new option to hide ticker box temporary. Just click top arrow at top right side to hide and collapse news ticker box with a click of a button. You can get back ticker box by clicking down arrow button at the same spot. This is more convenient way of hiding ticker box. However, if you want permanent removal – you can use either of web browser plugins in browser of your choice (as explained below). [Published on Sept 22, 2011] News ticker provide real time activity updates of your Facebook friends. While information is useful but implementation of ticker box is very annoying. It sticks to right side of the Facebook interface even when you scroll down taking all your attention which ideally should on the news stream column. 1. Google Chrome users can easily get rid of this news ticker box using Facebook News Ticker Remover Chrome extension. To get started, open Facebook News Ticker Remover extension [Not available now – chrome.google.com/webstore/detail/inbogeebjloglncnccgemjfedfhobfak – you can use FB Purity as explained below] in Google Chrome browser. Click Add to Chrome for automatic installation. After install, open Facebook website and you should be free of annoying news ticker box. 2. 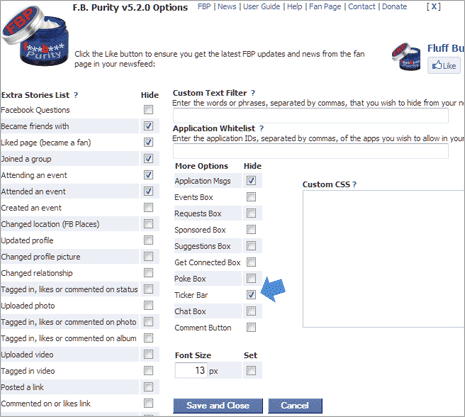 Firefox, Safari & Opera users can use Facebook Purity addon collection. This extension has been updated to remove news ticker from Facebook website when you browse it in either of Firefox, Opera or Safari web browser. For example: Firefox users can open F.B Purity homepage and then click Firefox option to download relevant addon for web browser. Once addon is installed, restart Firefox browser (you will get prompt for the same). After restart, open and login into Facebook website. Click on FB Purity options button above news feed at the top of Facebook website. This will open options box, click to check Ticker Bar option and then click ‘Save and Close’ button. This will remove ever so irritation new updates ticker box from right side of Facebook website. 3. Other web browser users can also use usestyle script for removing Facebook ticker box. You can use either of this or this user scripts in web browser of your choice to remove real time new updates ticker box at top right side of Facebook website.